Your rental includes McGee and Barter Islands. McGee Island is the larger of the two islands and has 3 residential structures: the Main House, the Cook House, and the Little Boat House. Barter is the smaller of the two islands, is undeveloped, and is accessible either by boat or by a natural land bridge that appears at low tide. The two islands nestled close to each other to form a natural deep-water harbor that can accommodate yachts up to 60 to 70 feet in length. If you don’t have a yacht, don’t worry; our caretaker will be happy to transport you and your luggage and groceries from Port Clyde to McGee in our 10-person island boat. 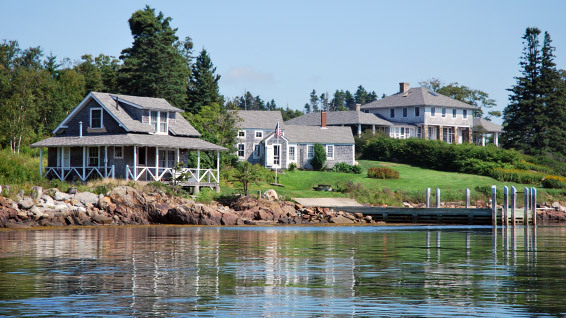 The Main House is a beautiful, traditional, shingled summer home built in 1915. The interior walls were left exposed showing the beautiful wood that was used to construct the building. It has 9 bedrooms with two King, three Queen, and seven twin beds that can sleep 17 people. There are 4 full bathrooms equipped with original claw foot-era tubs as well as a relatively-new, partially-enclosed outdoor shower which tends to be the favorite place for bathing. The Cook House, originally built in the late 1700’s, has a newly remodeled kitchen equipped with modern appliances and an outdoor BBQ gas grill. There are 2 dining areas in the Cook House. 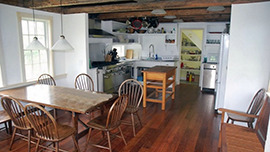 The breakfast table in the kitchen seats 6-8 and offers commanding views of the harbor. The adjoining dining room can seat up to 22 (more if everyone squeezes a bit). 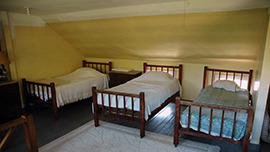 The Cook House also has a shower on the first floor and a large bedroom with 3 twin beds on the second floor. 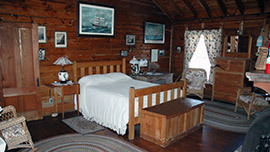 The Little Boat House, also built in the early 1900’s, is located right on the water. 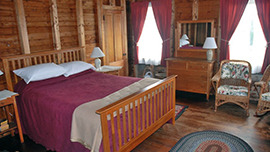 It has a porch, a comfortable living room, a kitchen, and a bathroom on the first floor. 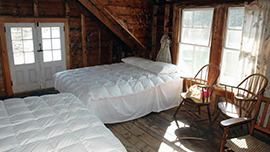 The second floor has 2 queen beds. 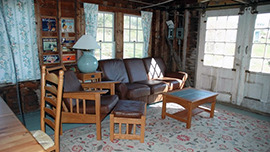 The Little Boat House is a favorite with teens as it provides a place where they can be on their own, yet is close enough to the Cook House for late night snacks. McGee Island is a great place to leave behind the hustle and bustle of daily life. There are no tvs or radios in the buildings. There is however, a Wi-Fi Internet connection for those who wish or need to stay connected. 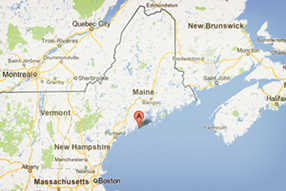 There also is mobile phone reception depending on where you are on the island (n.b., Verizon and US Cellular work best). Refrigerator : The kitchen is equipped with a 25 cubic foot refrigerator / freezer. The refrigerator is on top and the freezer is a pullout drawer on the bottom. There are also refrigerators in the Main House and Boat House. Dishwasher : Kitchen is equipped with a commercial dishwasher. Dishes are rinsed and placed in a rack before being placed in the dishwasher. The dishwasher cleans and sanitizes each rack in 2 minutes. Kitchen : The kitchen has a 48 inch gas-fueled, 8-burner commercial range with 2 ovens.